Earlier this year I wrote a piece (here) about how an effort to radically change the Washington debate on Social Security benefits (don’t cut them, increase them!) could be used as a model for recasting the debate (or lack thereof) on transportation funding. Now comes a new story (here) explaining how the effort to change the Social Security debate was consciously crafted to change the “Overton Window.” The supershort explanation of the Overton Window is that public policy options are considered to be serious only if they fit within a narrow window of acceptability (the Overton Window). So in the field of transportation finance, the conventional wisdom is that increasing taxes for transportation is politically infeasible and therefore is not a serious option. That option is not within the current Overton Window. Since all the “serious” options – within the current Overton Window – lead only to national decline, my answer (from the earlier piece) is: move the goalposts! Or, in Overton parlance: widen the Overton window! Whatever parlance or metaphor you prefer, it seems to me to be time to stop accepting failure as an option, let alone as a decree of the Fates. There’s not much I can add to the one-year-later Sandy retrospectives in the New York Times and other sources. They have covered many of the short-term and long-term impacts to transportation and other types of infrastructure. First, as some of us have pointed out (my comments a year ago here), the silver lining to the Sandy disaster, and other weather related disasters, could be that a growing majority of people involved in our public policy discourse will be climate change believers, not Flat Earthers. I believe there have been signs of that, although it’s discouraging when we see the prime minster of Australia, whose country is literally on fire, holding steadfast to denial. Second, it’s pretty clear that more and more public agencies – DOTs and others – are seriously incorporating climate change resilience and adaptation into their planning. That will be very helpful in coping with future events. 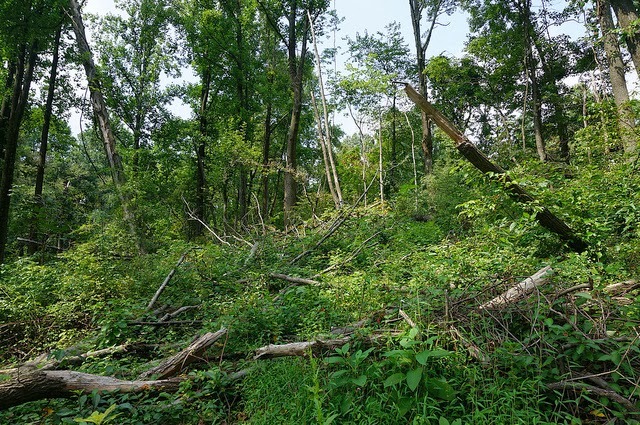 Finally, just to give a little perspective, this photo shows Sandy damage still visible a few weeks ago in a wildlife preserve along the Delaware River about 60 miles inland. 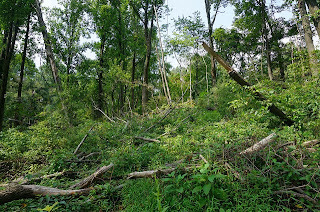 Although the Jersey Shore and urban areas got the most news coverage in the Sandy aftermath, the damage to inland rural areas and woodlands was immense. 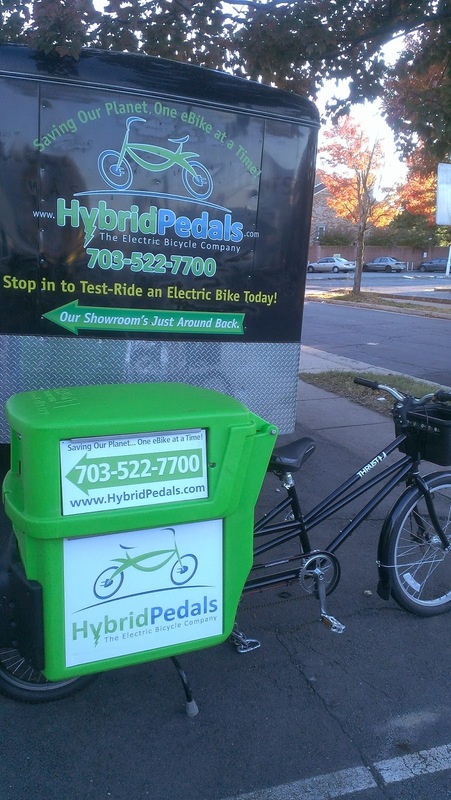 A new electric bicycle shop in Arlington, VA – Hybrid Pedals – is creating a lot of “buzz” (see their website here). 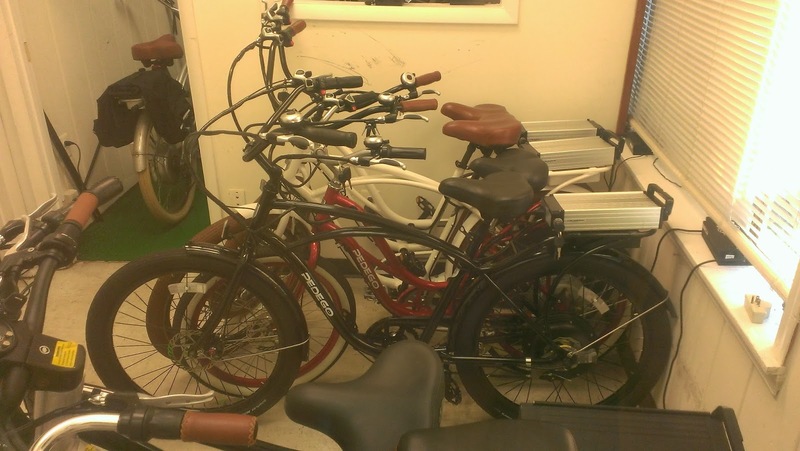 Alan Levine’s showroom is crammed with dozens of electric bikes: special built bikes (starting at around $1500), custom rebuilds (also at around $1500), folding bikes (for the Metro), and very high-end bikes (what Levine calls the “Lamborghini” of ebikes, for around $15,000!). He is working on an order now for the Atlantic City Policy Department, who are buying 30 ebikes with very fat tires for riding up and down the beach. Levine says that ebikes now make up better than 20 percent of bicycle sales in Europe, and he sees a similar trend here. The idea behind electric bikes, if you’re not familiar with them, is that you can use them like regular bikes, in bike lanes, etc., but can switch on the power for help getting up steep hills or on long commutes. You can even go entirely electric if you choose, say to commute to work without working up a sweat. The good news about ebikes – as with electric cars – is that batteries continue to get lighter and more powerful. The electric bicycle is just one more development, along with bikesharing, that is making bicycle transportation a mainstream option. Good luck to Hybrid Pedals! After a very solid, bipartisan vote for increased transportation funding in the Pennsylvania state Senate in June (45 – 5! ), the funding bill’s future is still very much in doubt in the House of Representatives (see press update here). The Senate bill (SB-1) isn’t perfect and lacks in substantive transportation reform measures. Nevertheless, it provides a significant funding bump and a real rebound from the Act 44 debacle (which hinged on the failed proposal to toll I-80). What I find most encouraging is, first, the real bipartisan support for a transportation revenue increase (at least in the Senate) and, second, the willingness to go to the motor fuels tax (although in a roundabout way) for revenue. 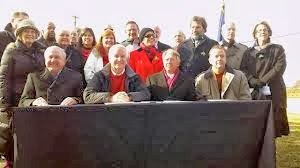 The bill, if passed, will enable PennDOT to invest heavily in attacking the structurally deficient bridge backlog (in which it has the dubious distinction of leading the nation) and to provide stable funding for transit. Hopefully, PennDOT will also use this as an opportunity (if the bill passes) to take on some other issues: a new Community Transportation Fund (based on the successful Pennsylvania Community Transportation Initiative of a few years ago), increased bike/ped funding, etc. Having spent a good deal of time reading (and some time writing!) officially-sounding papers on electric vehicles, it was refreshing to read a posting by Daily Kos blogger Assaf Oron that provides a somewhat grittier analysis (here). Oron does a pretty good takedown of some of the “conventional wisdom” negativity that often emerges from opponents – I use the term advisedly – of electric vehicles, although I am probably a bit more skeptical than he is about a quick blossoming of EVs. The most interesting part of the piece is his argument that electric vehicles are not really out of reach of average consumers. Leasing an EV, he argues, is actually cheaper than owning and maintaining a middle-age conventional car. He also analyzes the market forces affecting EVs, particularly noting the successes of Tesla. Oron ranges through a variety of EV issues in his string of posts on the subject, but, as I said above, the big takeaway is his assertion that we are rapidly approaching a tipping point at which EVs are no longer “the future” or a possible technological option but become a permanent part of our lives. Is he right? I’m not 100% sold on the proposition…but I’m probably 80% sold! The Congressional Research Service has published an excellent new report summarizing the transportation funding options we are likely to look at during a Reauthorization legislative process (“Funding and Financing Highways and Public Transportation,” available here). However, I do have a few quibbles. I have the same quibbles with most papers done on this subject, but I want to note them here as they can affect the policy process that the CRS paper will help to inform. Second, the paper alludes in passing to the “political difficulty” of raising the gas tax, but I think does not fully recognize that the perception of that “political difficulty” is pretty much the only reason we are passing over the obvious solution (increase and index the gas tax) in favor of more exotic options. Third, in common with most papers on the subject, the CRS effort, I believe, seriously underestimates the “political difficulty” of passing alternative taxes. 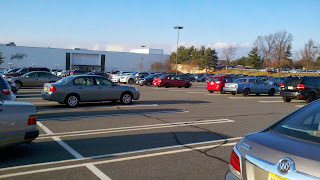 Do we really think that the anti-tax forces will be just fine with enacting a national sales tax or a VMT tax? I don’t understand why we think that novelty will make the medicine go down better. Fourth, I believe that the authors – again in common with many others – also seriously underestimates the likely opposition to a VMT tax due to the privacy issue. True, they suggest that data collection not using GPS systems may provoke less resistance than a system that does. That may be so, but remember we live in an age in which enacting a middle-of-the-road health insurance reform bill leads to talk of nullification and secession and in which scientists identifying the crisis of climate change are held to be fraudulent conspirators. 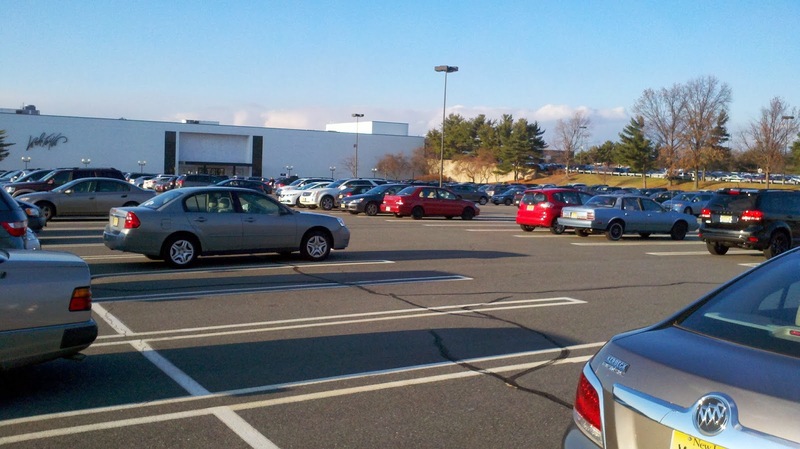 What do you think these people will say about a national VMT tax, even if it starts out on a low-tech basis? All of that is fine, but does anyone notice anything missing? Is the commission going to be charged with creating an actual program, as opposed to just a prioritized list? And will they also be charged with calculating the cost of that program and proposing options for raising the revenue to pay for it? 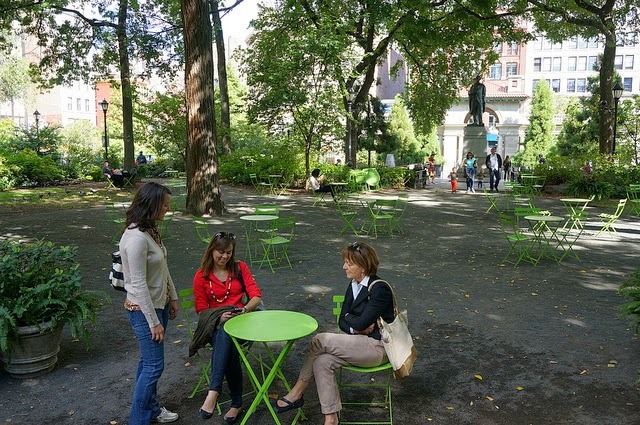 New York, New York, It’s a Walkable Town! Or at least it’s getting to be one. I still find walking through the canyonlands of midtown Manhattan to be more work than pleasure, but even there the work done to tame Times Square (very much under construction) promises a bright future. And strolling down Broadway is much more pleasant than it previously was, with many pedestrianized areas that seem to be very supportive of a revitalizing retail economy. The older squares along Broadway (Madison Square and Union Square, in particular) I found to be delightful urban experiences on a beautiful Fall day. 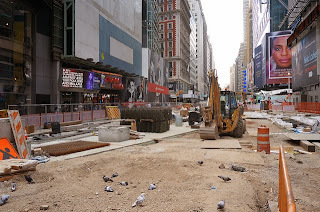 Kudos to Mayor Bloomberg, Janette Sadik-Kahn, and New York City DOT for a fine job (amid the usual New York sound and fury) in planning and implementing a new way of thinking about transportation and land use in the city. Social and economic trends are also making a big difference. 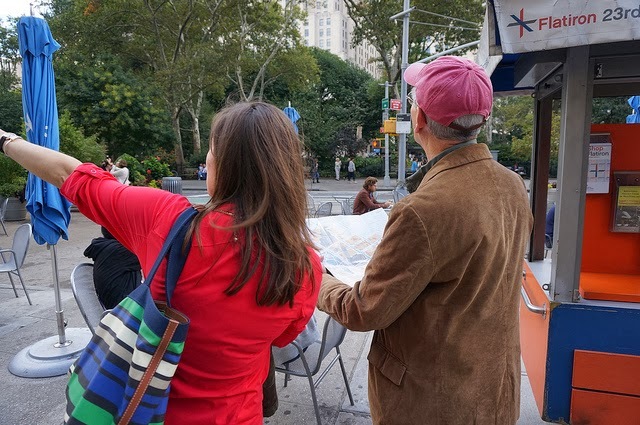 Many parts of lower Manhattan and Brooklyn – with a much better development scale for pedestrians than midtown – have seen major revitalization, with exciting residential, commercial, and cultural development. For those of us that remember a grungier – and more dangerous – New York, these changes are heartening indeed. And they show how solid (and sometime fearless) transportation policies can enable transformations that benefit everyone’s quality of life. High Line in Early Fall – Spectacular! I’m sure there’s nothing new I can say about New York’s High Line (the former elevated freight rail line now repurposed as a landscaped walkway) but I will just note that a recent visit on a beautiful early Fall day confirms that this is one of the best pedestrian projects in the country. Tourists from around the world (the variety of languages is amazing) come to walk the High Line, and with good reason. 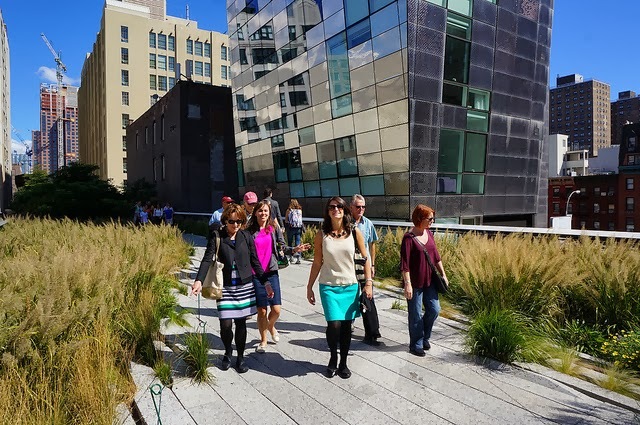 Now open for four years, the High Line’s incredible views, lush landscaping, and well-maintained pathway combine to make the walk a delightful experience. When the new Whitney Museum building opens in 2015 at the bottom end of the High Line, the whole area (the “Meatpacking District” describes its past) will be a real showcase. Unfortunately neither the Whitney nor any other adjacent building has any direct access to the High Line, and apparently does not plan to. The High Line is maintained by its own nonprofit (link here) which has done a remarkable job. 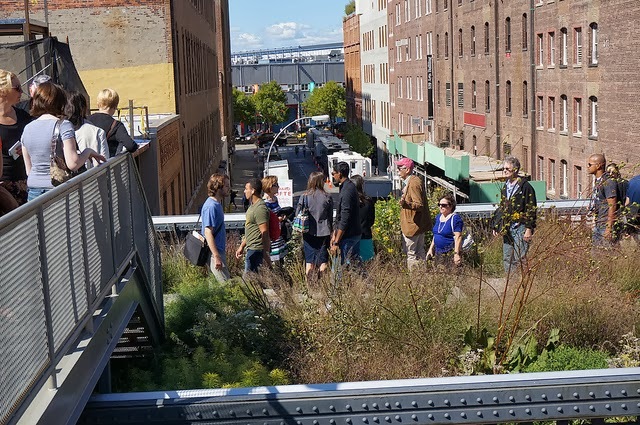 I know that the success of the High Line has started other cities thinking about how they can repurpose some of the odd remnants of infrastructure they are left with. Can’t see to see some more creative projects! I frequently call attention to the “inconvenient truth” about transportation funding, which is that even the most ambitious funding initiatives that get bandied about at the federal and state levels are pretty much limited to patching up our inherited, legacy transportation system. 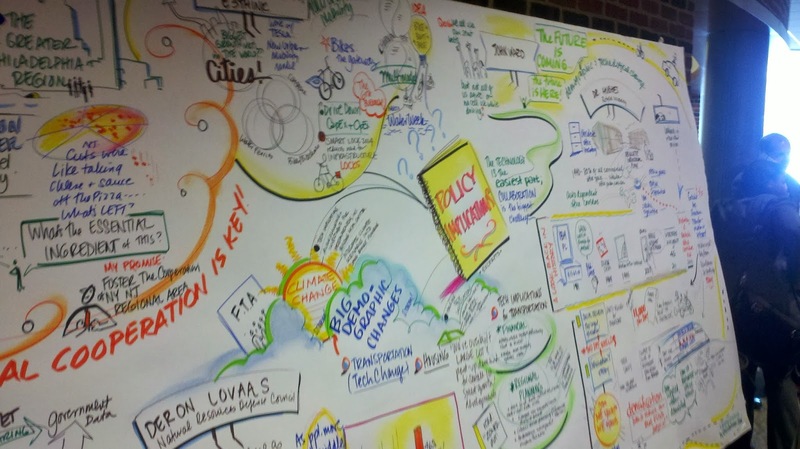 They do little to plan, design, and build a 21st Century system (see my posting here). That comment is sometimes followed up by a question to me: so what does a 21st Century transportation system look like? That’s a good question, and one that some of us are working away at. 1. Shift long­distance freight transport to electrified rail or electrified grid­charged or powered trucks. Build out rail infrastructure to allow modal shift to rail versus road. 2. Shift freight and passenger fleets to battery electric transportation with battery swap or in­motion inductive charging capability. 3. Build high speed rail, electrified express rail or equivalently rapid electrified public transit between major cities to replace much short and middle distance air travel. 4. Shift high traffic public transportation routes to electrified commuter rail, light rail, subway, elevated rail, trolleybus, street car or electric bus. 5. Build electric vehicle charging infrastructure in multifamily, single family residences, office parking facilities and public streets. 6. Build rapid charge, roadway charging, and/or battery swap infrastructure to facilitate electric vehicle travel over middle and longer distances. 7. Increase electrical energy storage performance by a factor of 2 per decade. 8. Facilitate transition from self­driven to programmable computer driven autonomous vehicles (increasing capacity of existing road infrastructure and reducing emissions). Interestingly, most of the technology to make these changes is already available or reachable within the near future. And all of them make pretty good sense to me. As always, the institutional issues are the tough ones. The toughest of these eight are probably number 1 and number 2, dealing with freight. Building an electrified Steel Interstate and shifting long-haul freight to it is not something we can easily figure out. And in case you were wondering, the author recognizes the importance both of land use planning and of decarbonizing electricity supply. Hoexter goes into a lot of other issues involving climate change and related social and political concerns – all controversial – but on the transportation side, at least, I’d give him high marks for a envisioning a real 21st Century transportation system.